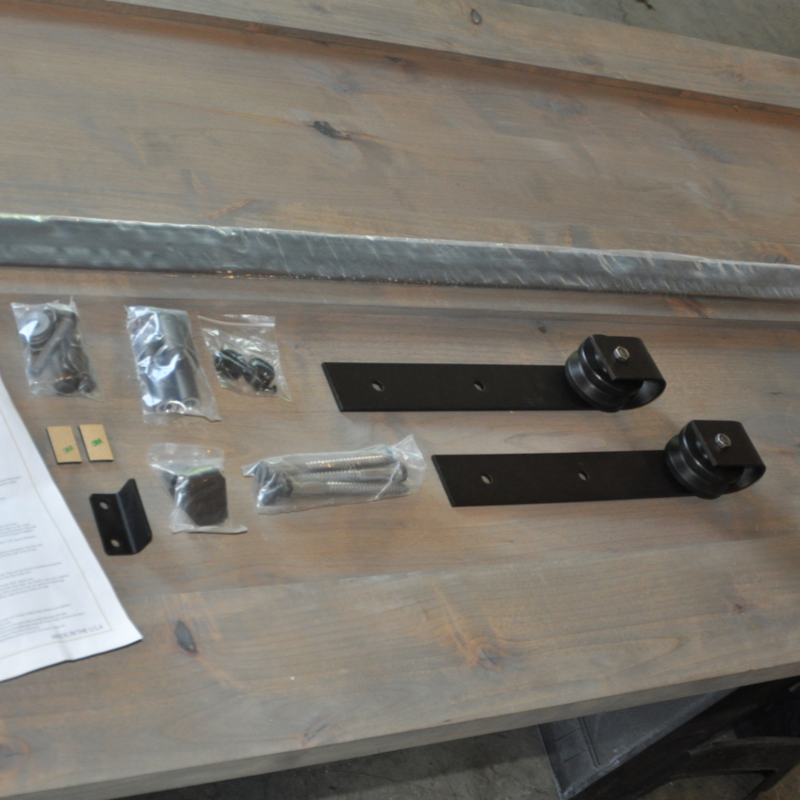 DIY Classic Barn Door Hardware from Artisan Hardware. 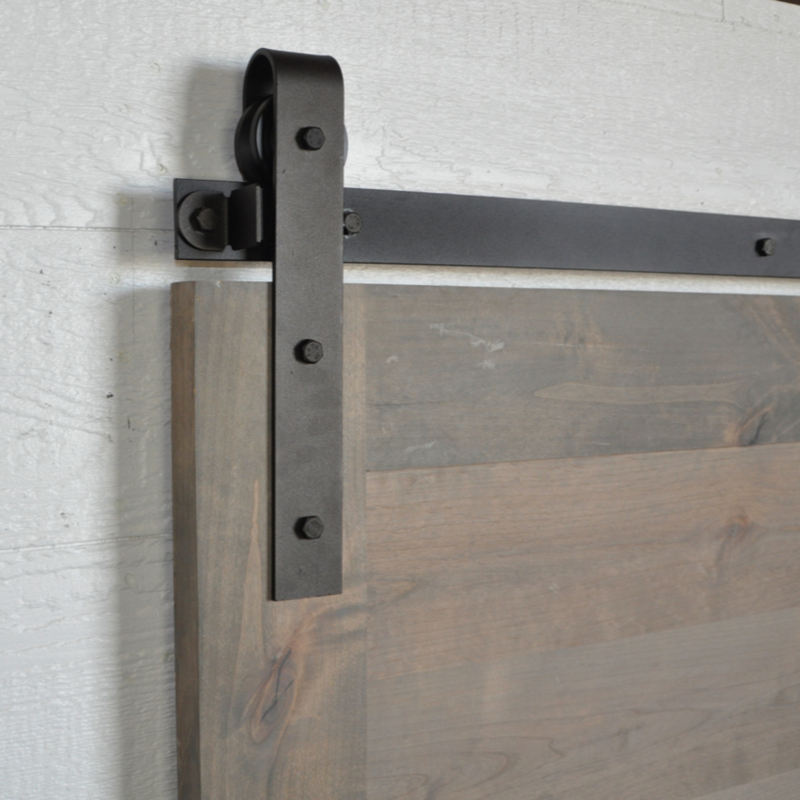 Custom sliding barn doors from Artisan Hardware. Packaging and hardware include small parts that can cause choking or suffocation. Keep away from children. Failure to install this product correctly or improper use of tools could result in loss of control, serious injury, or death. Ensure you have complete control of tools at all times. 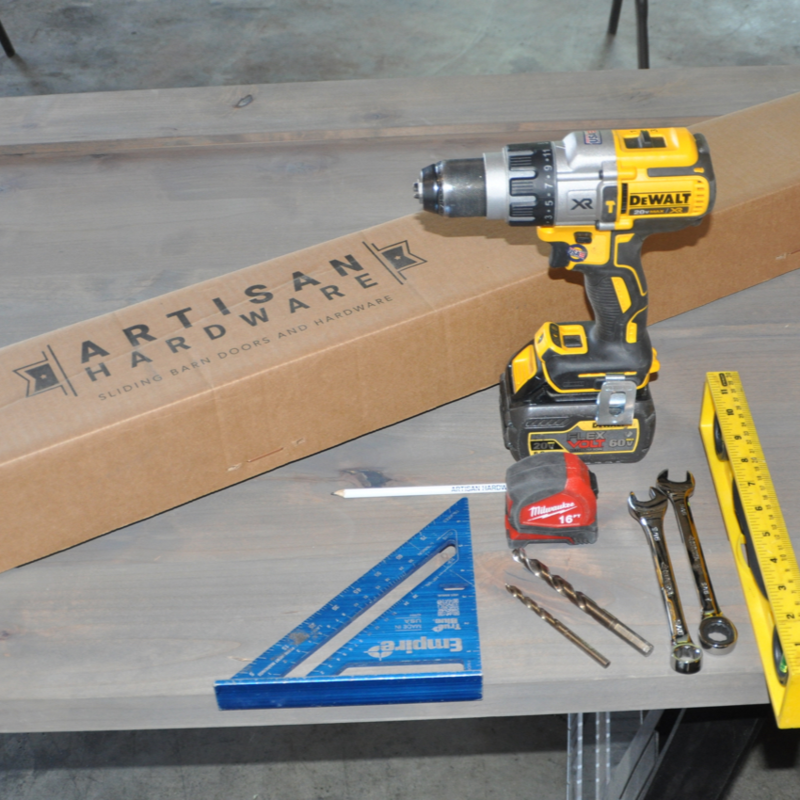 Artisan Hardware is not responsible for any damages or harm caused by the improper installation of products. Report damages or material shortages within 48 hours from delivery. Review all terms and conditions before installing products. Procedures can differ based on environmental circumstances. This product can be installed by an experienced do-it-yourselfer. If you are not familiar with basic door-hanging procedures, we recommend using a professional contractor to install this product. Use proper safety gear and follow industry regulations to get the best quality, security, and satisfaction. All hardware must have proper clearance and be securely attached into studs, solid blocking, head casing, full header, or other structural material that is built to bear weight requirements. Always follow industry safety standards and best practices. 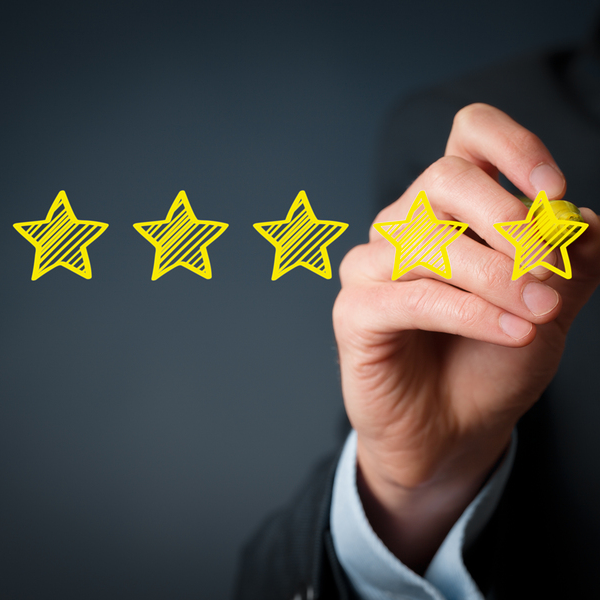 Every product is custom due to variations in size, structural, and cosmetic factors. NOTE: quantity will vary depending on size of door and track. Lay the door flat on sturdy saw horses or on a raised workbench with the front side up. Place hangers at the top of the door to mark holes. Place hanger two inches from the side. NOTE: We recommend two inches from the edge. Alternatively, you can place the hanger in the center of the vertical stile for asthetic appeal. 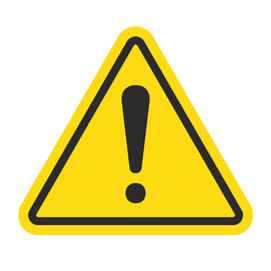 WARNING: Make sure that the wheel at the top of the hanger does not extend over the vertical edge of the door to ensure the door can open and close all the way with enough room on the track for your stops. Place hanger 2 1/4" from the bottom of the wheel to the top of the door. NOTE: In this image, the hanger is reversed for easier measurement. Make sure the wheel is toward (over) the door when you bolt it on. Make sure the hanger is square to the door and mark the holes on the door. 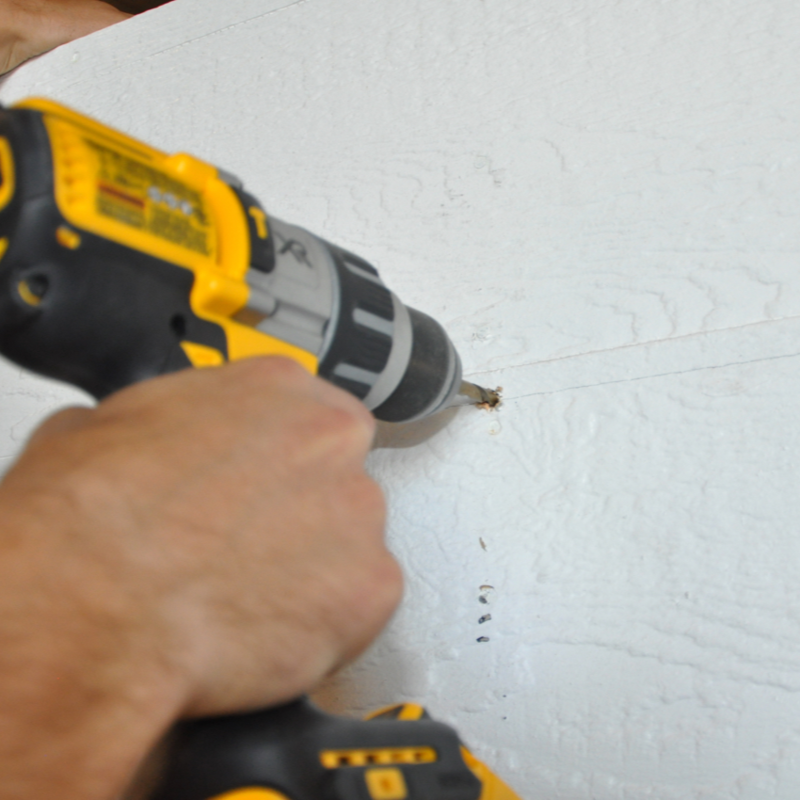 Set the hangers aside and drill the holes completely through the door using the 3/8" drill bit. Make sure holes are straight. 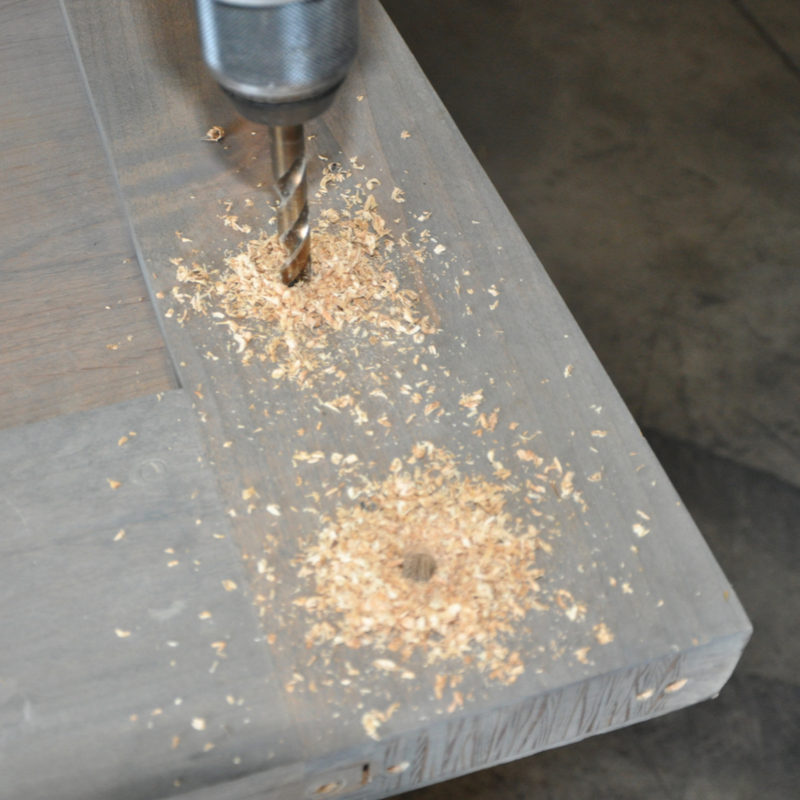 We recommend using a drill jig for best accuracy. 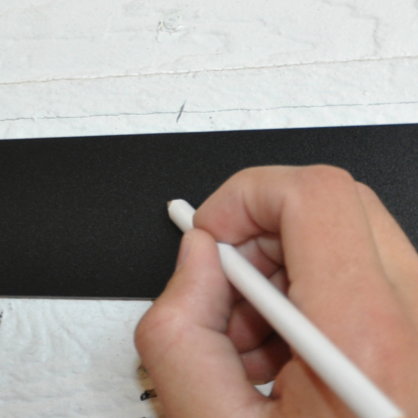 Clean away the debris and replace the hangers over the holes. 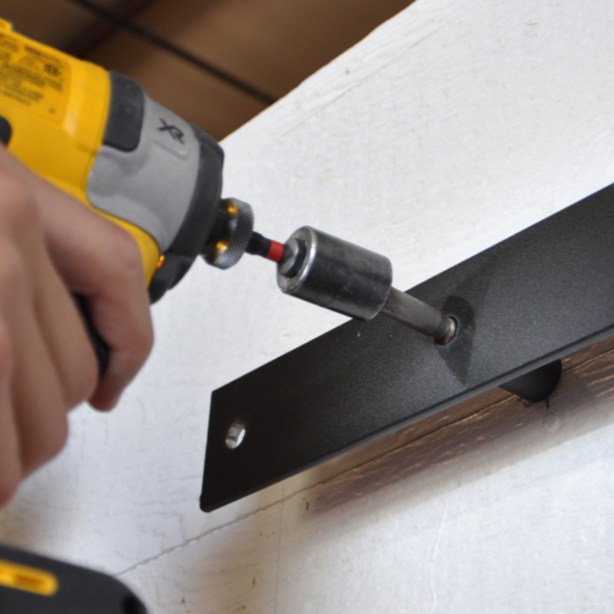 Insert hex bolts through hanger and holes. Make sure wheel is toward (over) the door. Place washer and nut on back side and tighten with open-end wrench. 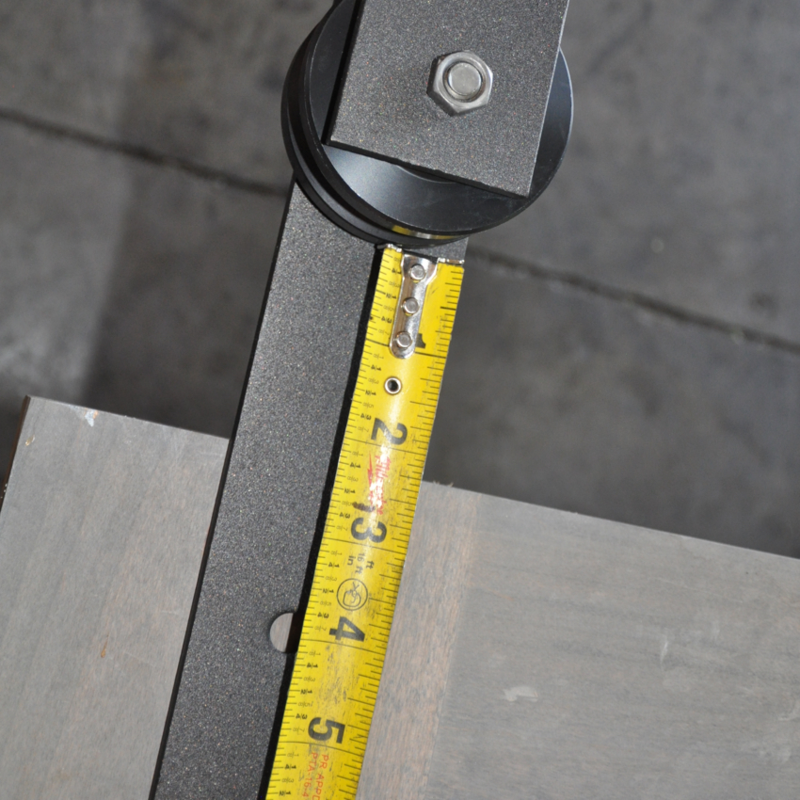 The bolts we send will work with a door up to 1 3/4" thick. 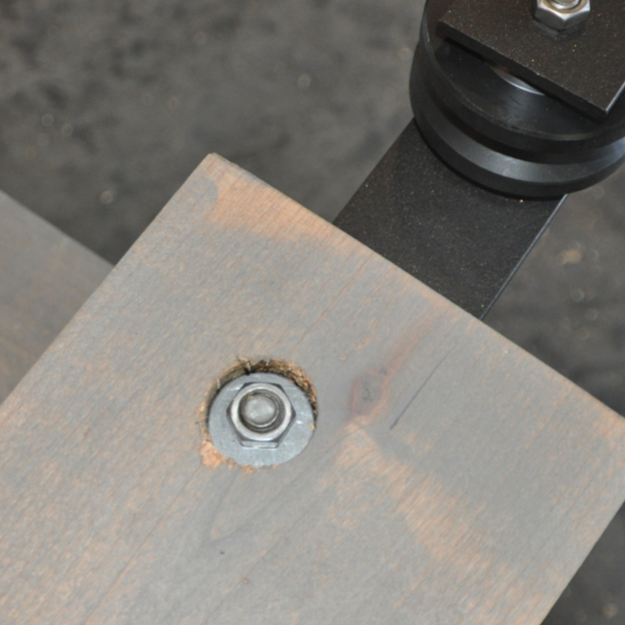 If your door is thicker than 1 3/4" you will need to recess the nuts and washers so the bolt will fit. If you want to recess the nuts and washers for asthetic reasons and your door is 1 3/4" thick or less, you will need to purchase smaller bolts. 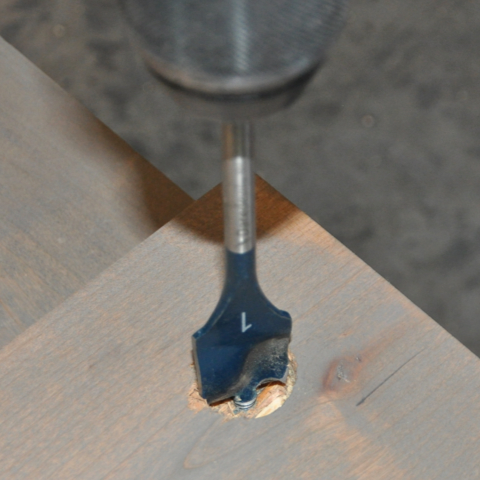 Use a 1" spade bit to drill a recess hole for the washer and nut. This is an optional procedure. 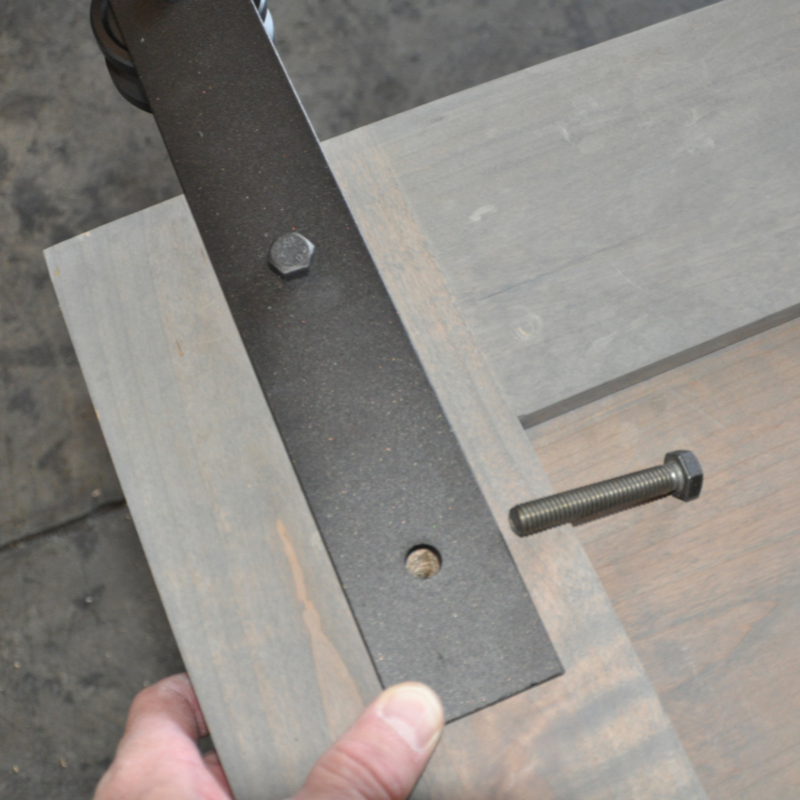 You do not need to recess the bolts if your door is 1 3/4" thick or less. 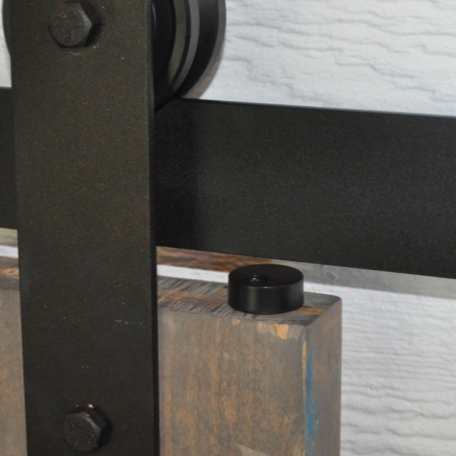 Recessed nuts offer a unique decorative feature or may help you avoid obstacles where needed, but are not necessary for normal operation of the sliding barn door. Recessing washers and nuts is optional. Secure both hangers to each side of the door. They will look like this when finished. Mark the center line of the track on a piece of tape or on the track itself. 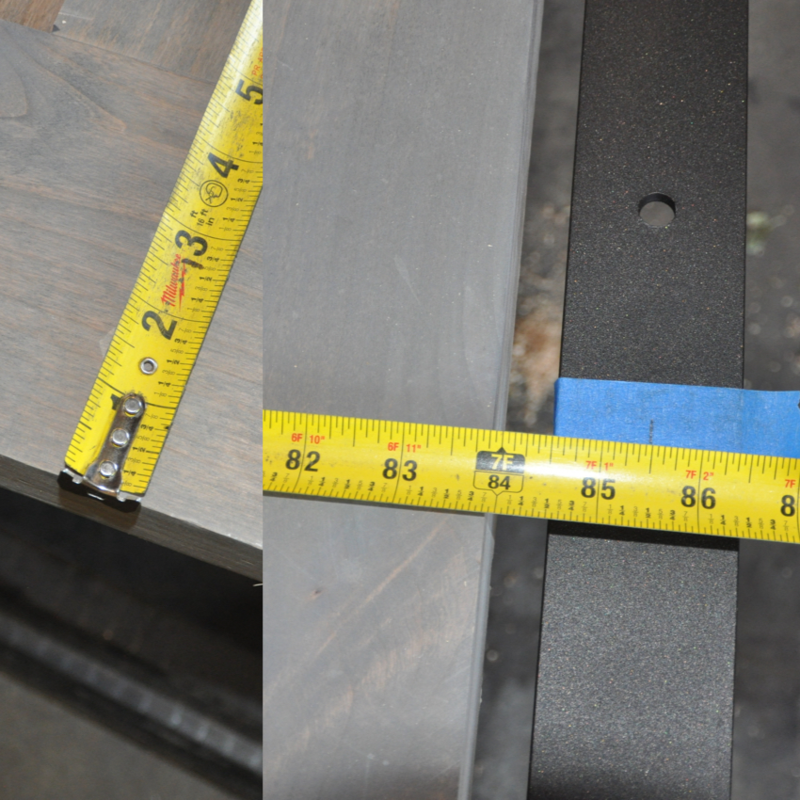 Add 3/4" for clearance and door guide space. Check to make sure your floor is level. If your floor is not level, you may need to adjust this measurement. THIS IS YOUR CENTERLINE TRACK HEIGHT. 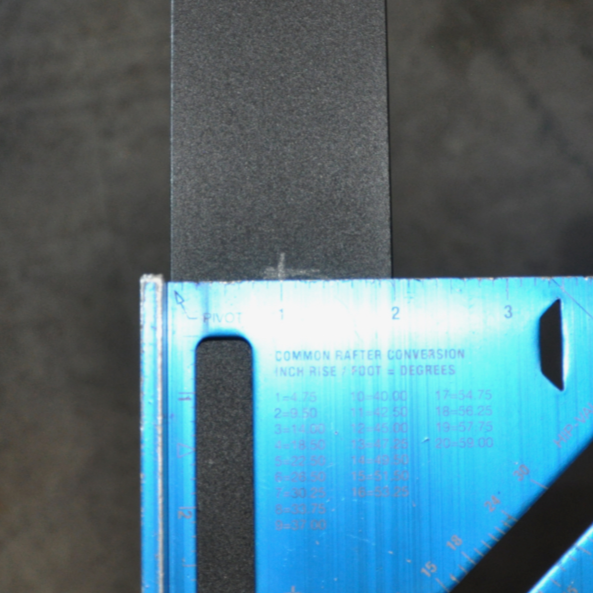 NOTE: In this example, Centerline Height is 86 1/4" (85 1/2" + 3/4" = 86 1/4"). 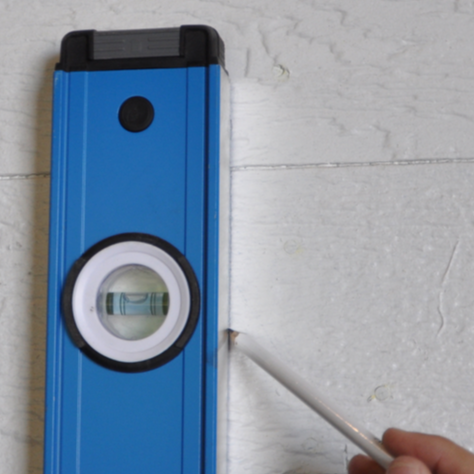 85 1/2" is the measurement from the bottom of the door to the center of the track. 3/4" is the gap between the bottom of the door and the floor for the door guide. 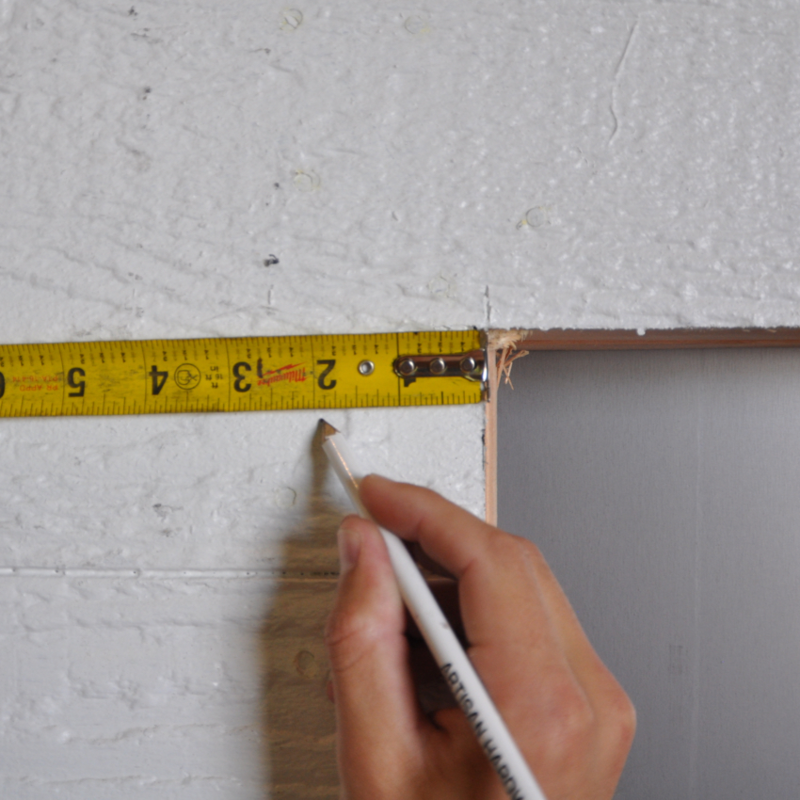 Mark the Centerline Track Height on your wall. 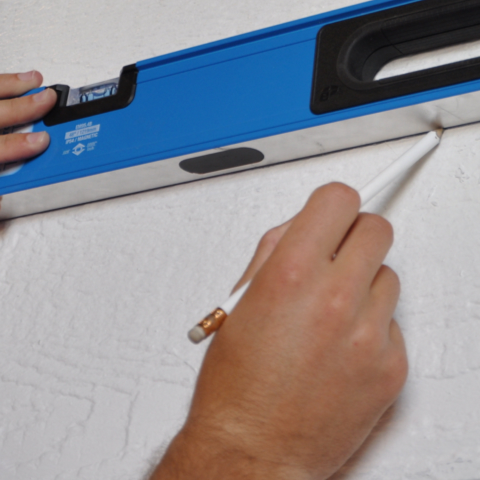 Mark one end and extend a horizontal line on your wall using a level for best results. 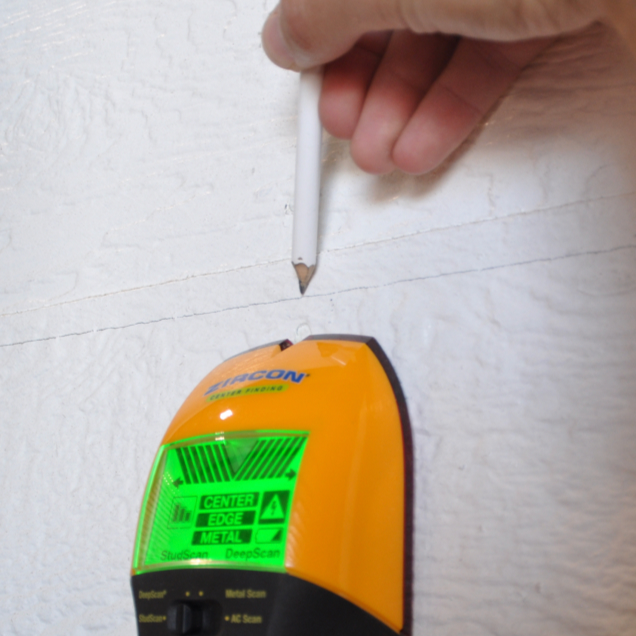 Use your studfinder to mark the studs along your horizontal line. This is where you will drill your holes for the lag screws. 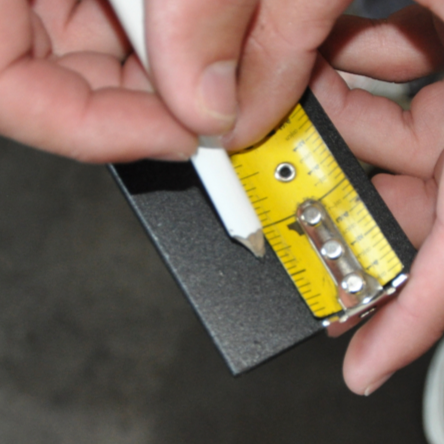 To determine the Closing End Point of your track, measure two inches from your door opening. This will be the closing side of your track. The track will extend from this point over the opening and beyond where the door will slide to when it is in the open position. NOTE: This is the minimum amount of space you will need to make sure your door covers the entire opening when in the closed position. 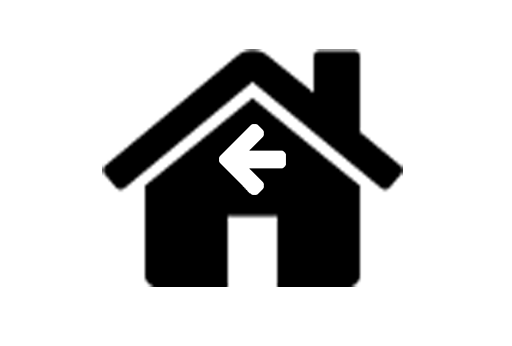 You can start your track on the left or right side of the door, depending on which way you want it to slide. This measurement is the stopping point when the door is closed. You can extend the track beyond this point, however, you will need to make your own revised calculations for the door stops in a future step. Use a level to extend this mark up to the Centerline Track Height line. This is the Closing End Point of your track. Hold the track up to the Centerline Track Height with one end at the Closing End Point mark on the wall. Transfer the stud marks to the track. These will be the hole points on the track. If your TRACK IS PREDRILLED, please move on to step 24. 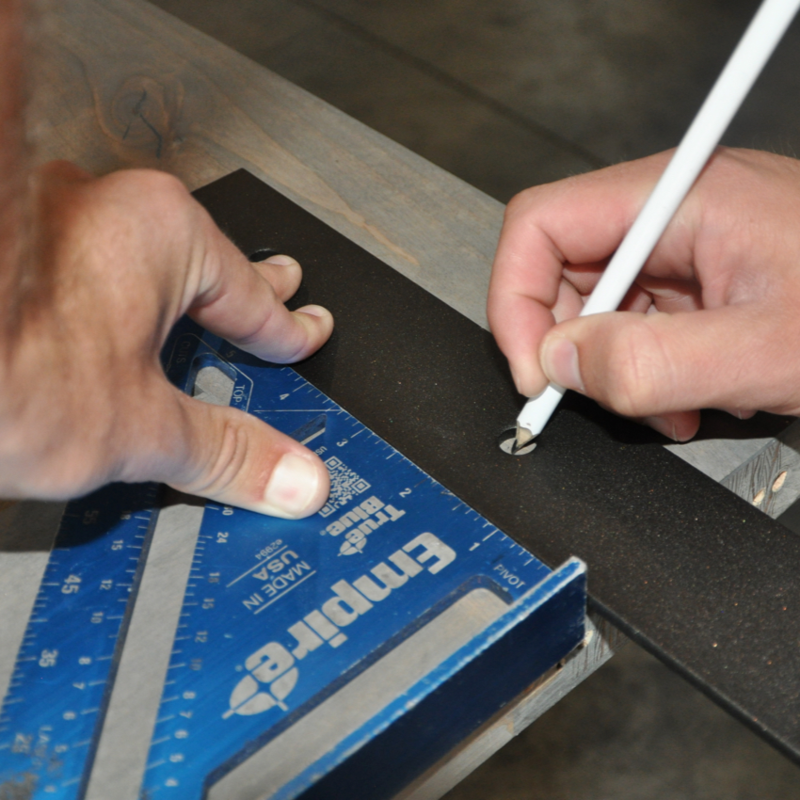 Make an additional mark on the track 3/4 inch from each end. These will mark the holes that will hold the bolts for the door stops on each end. Using a square, mark the center points for each hole on the track. This is the intersection between the horizontal Center Line on the track, and the vertical stud marks you transferred to the track from the wall. 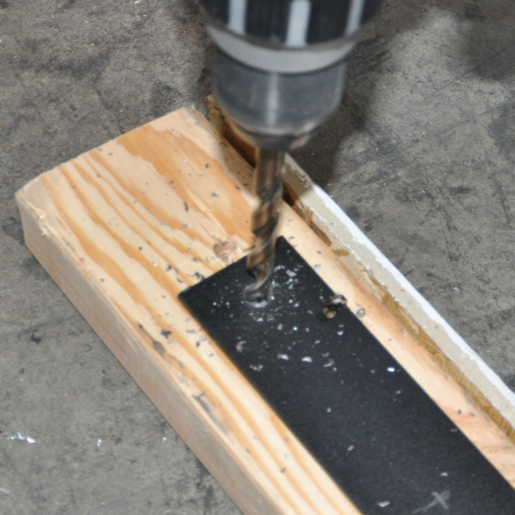 Drill the door stop and stud holes in the track using the 3/8" drill bit. Use a scrap of wood for backing support. Secure the track so it doesn't spin away from you. Use safety goggles and gloves for best practice. Be careful of sharp edges and metal slivers. Mark holes on center line. 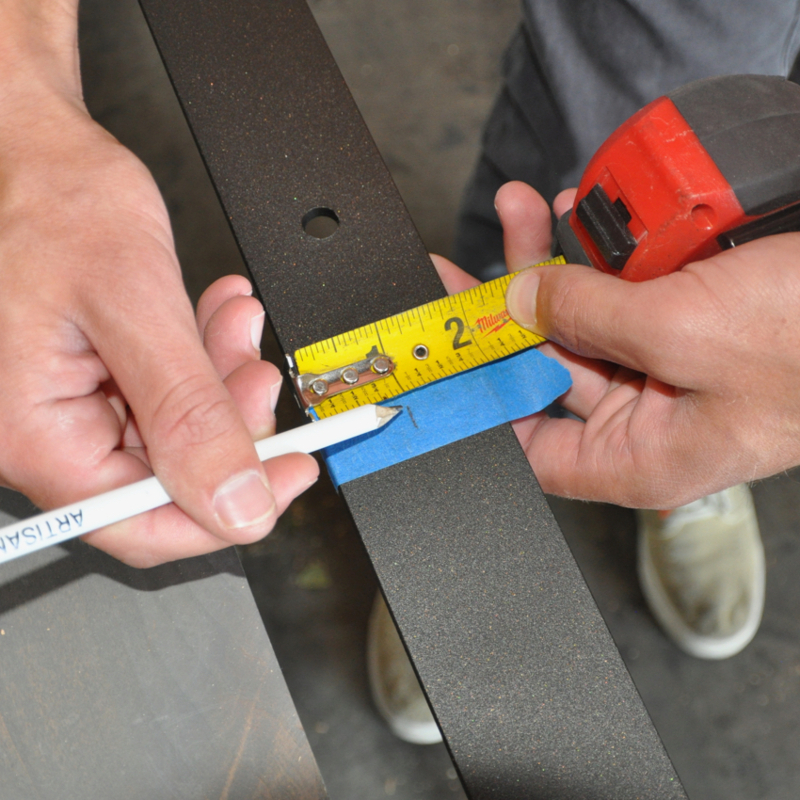 WARNING: using track with pre-drilled holes requires that you have full solid backing, or that your holes align with studs. Please make sure you have solid backing before installing pre-drilled track. Drill pilot holes for the lag screws into the wall using the 1/4" drill bit. NOTE: Only drill holes for the number of lag screws you will use. Assemble the lag screws through the holes in the track, and then through the spacers. 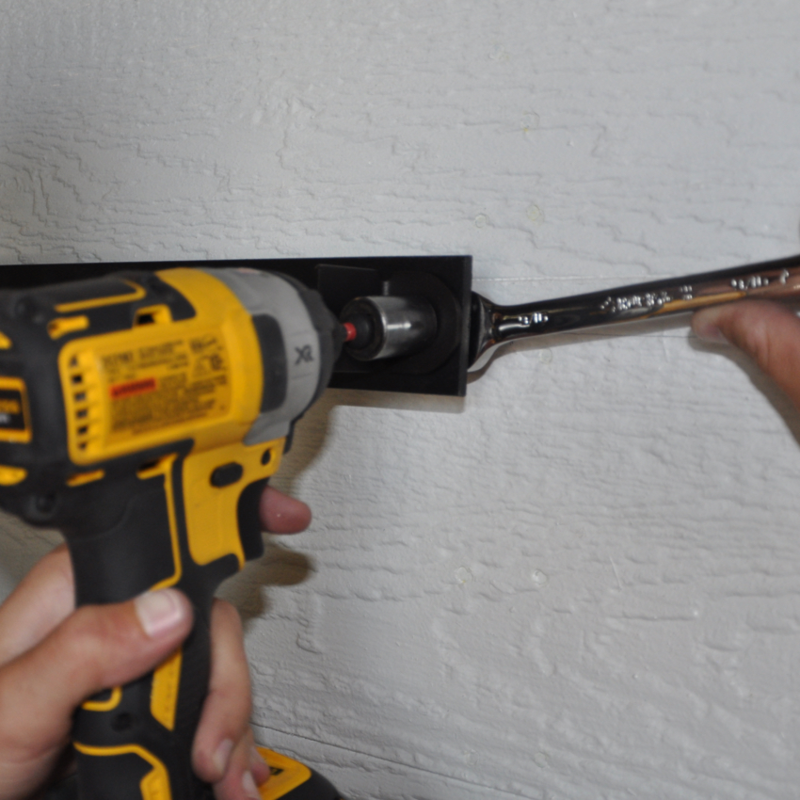 Use the open-end wrench to tighten the lag screws into the wall holes. 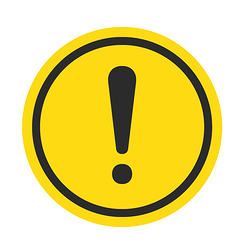 WARNING: Do not tighten lag screws too much against drywall or the spacers will push sink into the drywall and cause damage. Be careful only to "snug" the spacers to the wall. 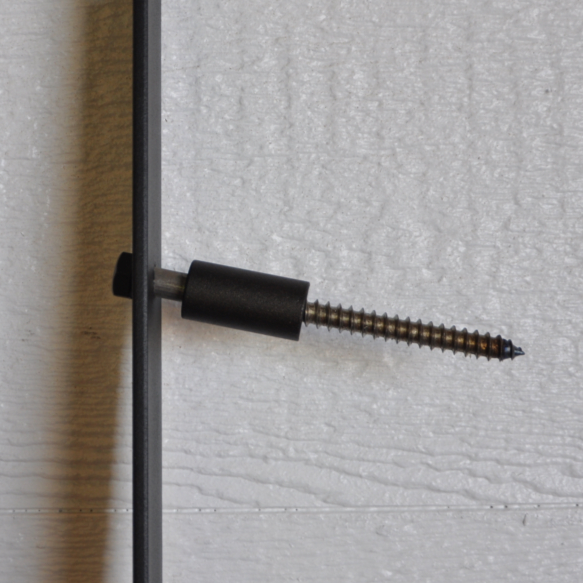 You can use a socket wrench or nut driver to secure the lag screws. Have a buddy help you hold the track to the wall while you fasten the lag screws. 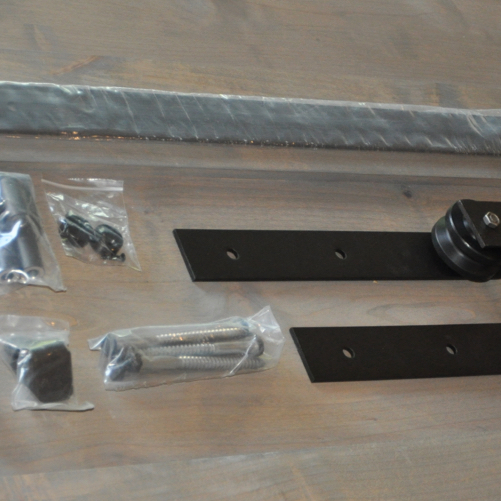 Fasten the door stops to the end holes using the short hex bolts and nuts. 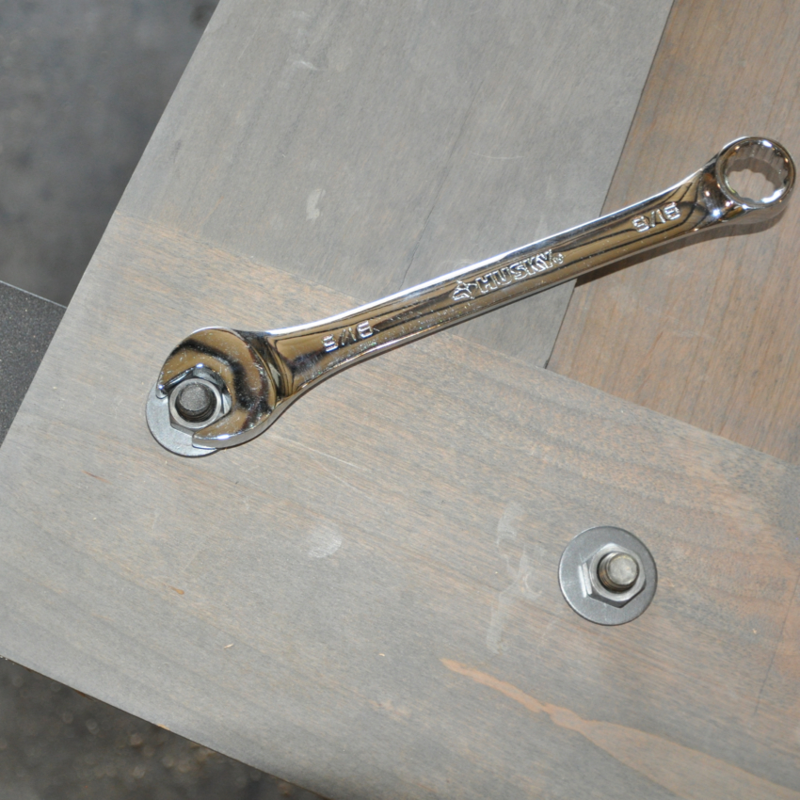 You may need to hold the back nut with an open-end wrench while you tighten from the front. Make sure the "flag" part of the door stop is facing inward toward the opening so that the door stops before encountering the hex bolt. Stick the rubber pads on the inside of the door stop. 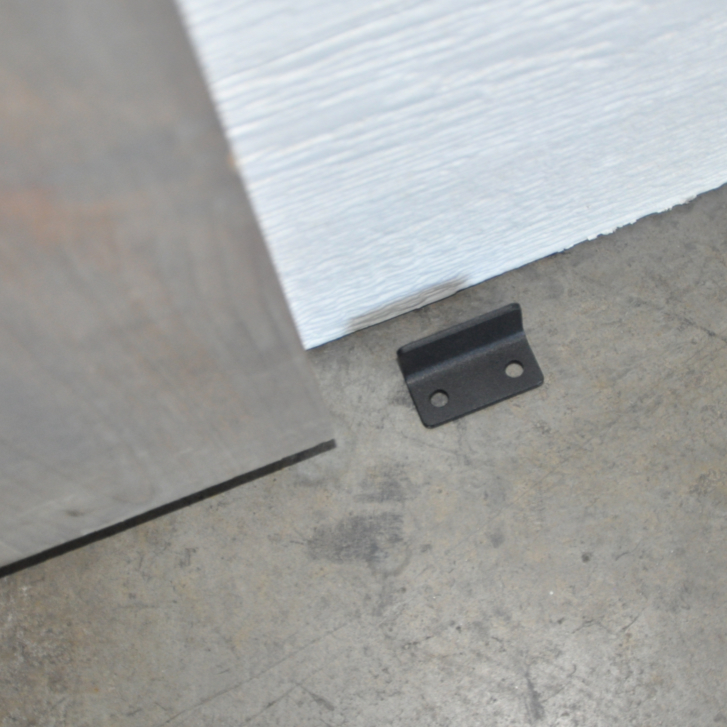 Note: If your hardware is stainless steel, your door stops will look different. They will look similarly to the track spacers. The installation process will be the same. 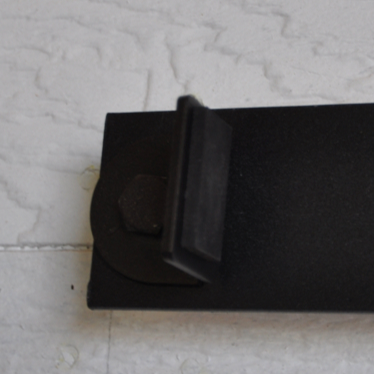 The door stop and rubber pad will stop the door from sliding off the track when you open or close the door. Hang the door on the track. Slide the wheels over the track and let the door hang. Have a buddy help you with the door. Add the round anti-jump guards at each end of the door. Screw the anti-jump guards to the top of the door between the door and the track using the wood screws. This will prevent the door from jumping the track and falling. NOTE: This is an important safety step. Do Not Skip This Step. Bolt the door guide to the floor. Align the guide to the groove in the bottom of the door. Hardware for this step is not included in the box. Use wood screws to secure to wood or soft flooring material. Use anchor bolts for concrete. This will require pre-drilling holes. 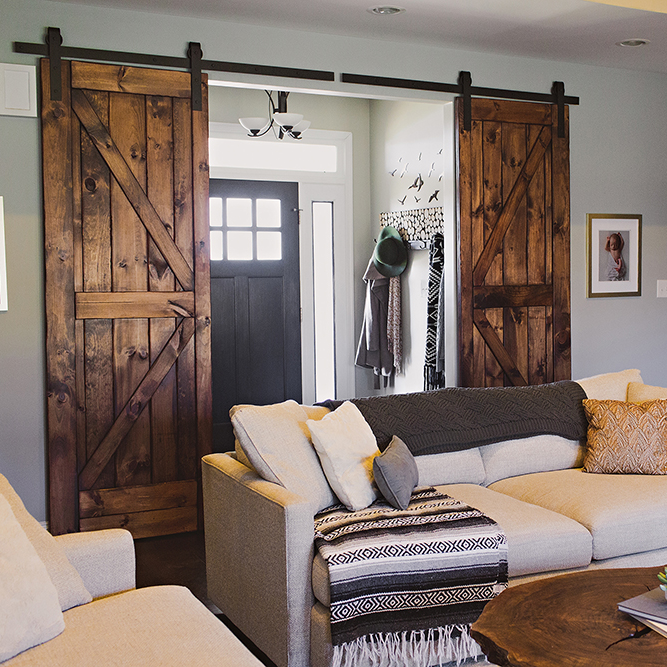 Do you love your new Classic Sliding Barn Door from Artisan Hardware? Will you share your project? 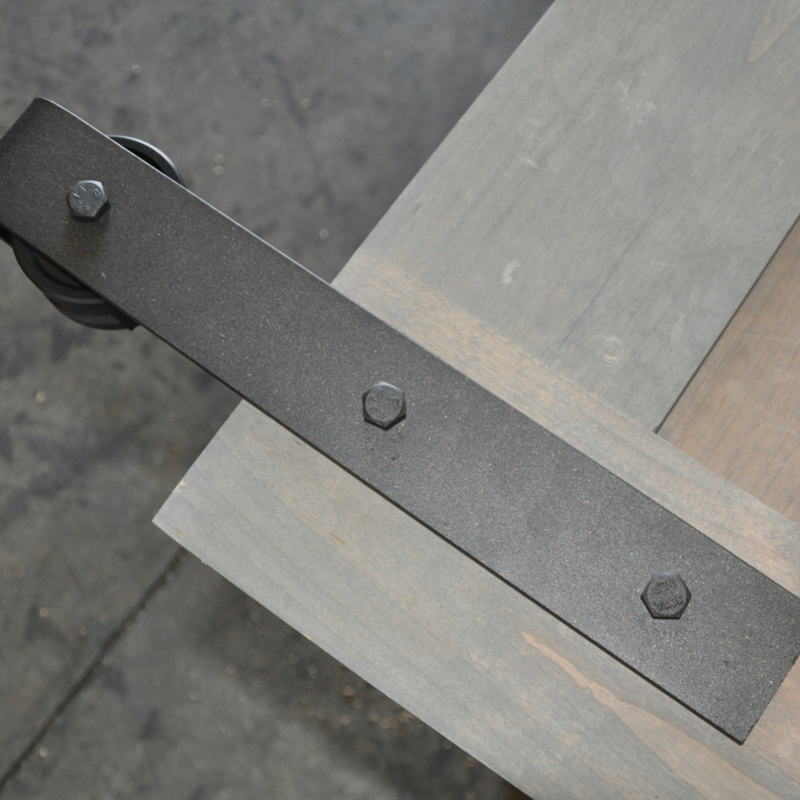 We would love to see what you've done with your Artisan Hardware door. Please send us a photo of your installed door. Make sure it does not include anything personal or private. By sending us a photo of your door you also give us the rights to share, print, publish and post the photo on our website or promotional materials. Thank you! 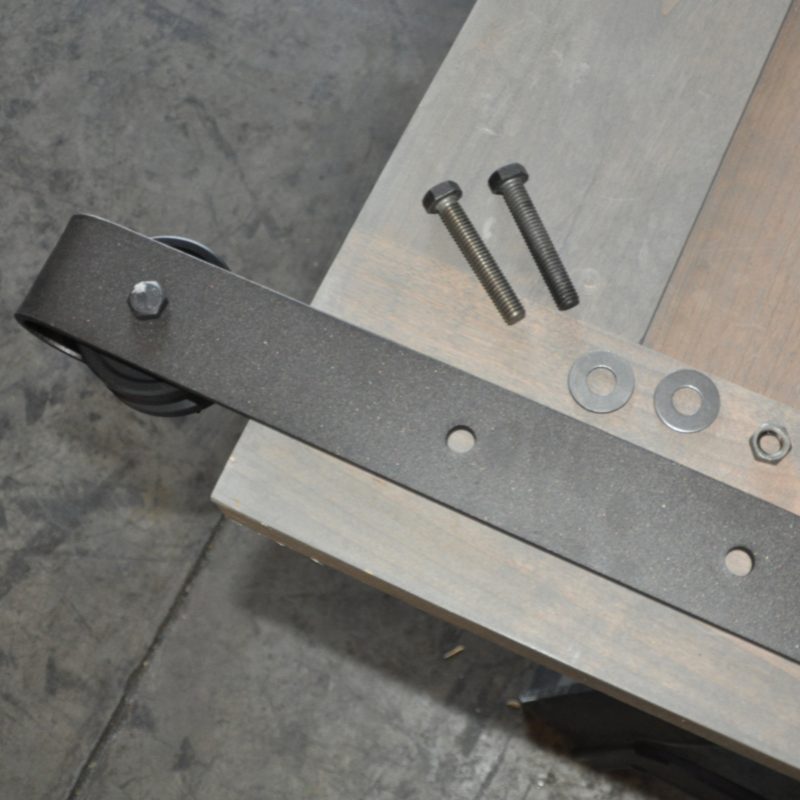 For more information about this solution, visit https://artisanhardware.com/classic-barn-door-hardware, or complete this form and we'll contact you to answer your questions.